Download a free invoice form designed to keep things simple. This invoice template is about as simple as it gets. If you are looking for something extremely easy to use, without all the extra features that can make some invoice forms more complicated than they need to be, download the new Basic Invoice Template below. With this template, we've tried to boil the invoice down to just the bare essentials. The screenshot really speaks for itself. This is just a basic invoice at its core. If this is a bit TOO basic for you, the next step would be the billing invoice template which uses the same design but includes a few more features. This template has only one formula - the SUM formula used to calculate the total. But, that doesn't mean that you can't use more formulas if you want to. For example, enter =5*75 in the Amount column to calculate the amount to charge for 5 hours at $75/hour. 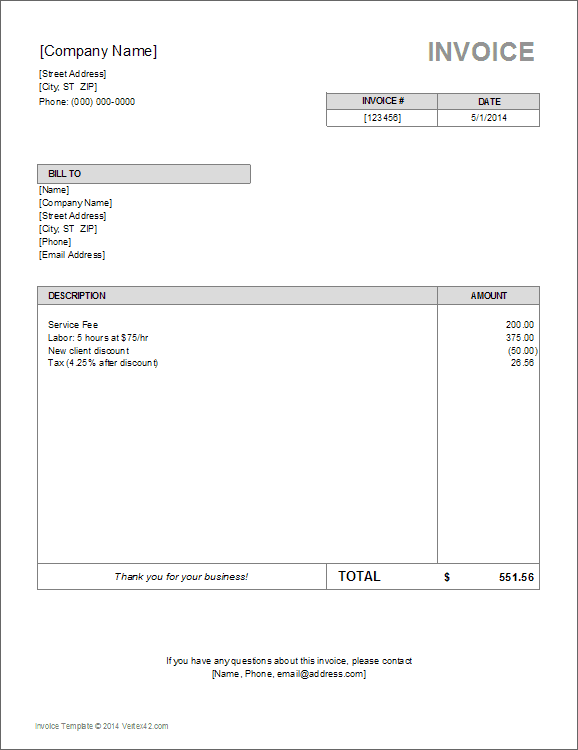 TIP: To create a receipt using this template, just change the word INVOICE in the header to RECEIPT. You can also add a note below the Total saying "Paid in full," or like with the simple receipt example, you can add a text box with the word "Paid." If you are want to mail the receipt you can just write (by hand) a note like "Paid. Thank you!" on the form. Invoicing with Excel - Read this article for tips on keeping track of your invoices. Use the Invoice Tracker spreadsheet to keep track of your paid and unpaid invoices.